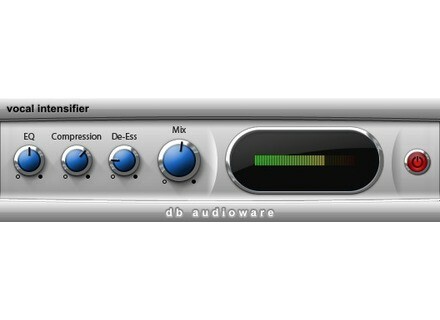 Vocal Intensifier, Other Effect Plug-in from db Audioware. Db Audioware introduces Vocal Intensifier. This plug-in contains an advanced algorithm designed to make vocals sit more prominently in the mix, without destroying the detail in the original performance. At the heart of Vocal Intensifier is a technique known as parallel compression (also known as "New York compression"). This is combined with a vocal effect chain (containing gating, EQ, compression, de-essing & limiting, all tuned for vocals), and presented in an easy to use interface with only four controls. Works with any host program supporting VST (2.4 supported) or Audio Unit. Syntheway Percussion Kit Syntheway Percussion Kit is a collection of percussion instruments designed for creating Orchestral Percussion, Auxiliary Percussion, Mallet Percussion, Latin Percussion and African Percussion. The Outhouse Inerthia 1.70 The Outhouse presents the 1.70 version of Inerthia, a VCA Opto compressor plug-in for the PC VST format. PowerFX World Loop Spice Rack PowerFX presents World Loop Spice Rack, an ethnic sample library.